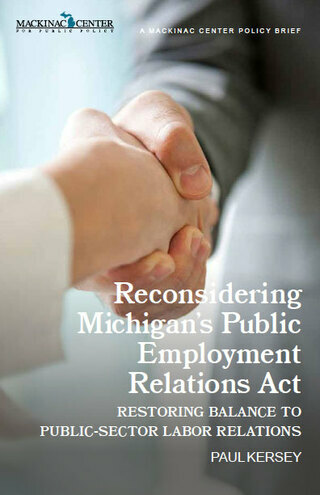 In an earlier Policy Brief, “Michigan’s Public Employment Relations Act: Public-Sector Labor Law and Its Consequences,” we reviewed several negative effects that the 1965 law has had on Michigan government and the economy. For example, PERA has inadvertently granted public-sector unions, in their role as the representatives of government workers who implement local laws and policies, an effective veto power over many laws that have been passed by residents or their elected representatives. In addition, PERA has permitted local government employee unions to collect mandatory “agency fees” from government workers who do not wish to join, empowering those unions to become a permanent, subsidized lobby for big government. This report outlines a variety of ways the Michigan Legislature can address the damaging impact of PERA. These options range from modest, targeted reforms to an outright ban on collective bargaining in local units of government. Establish additional statutory limits on the subject matter of collective bargaining, backed by a strong enforcement mechanism, to ensure that the public retains control over important policy decisions. At a minimum, the state Legislature should require that collective bargaining agreements conform with state laws and local ordinances. Suspend collective bargaining privileges and agreements when government employee unions flagrantly violate PERA by going on strike. Collective bargaining for government employees is a privilege, not a right. “Abuse the privilege, lose the privilege” is a sound rule. Bar agency fees from public-employee collective bargaining agreements — in other words, an “open government employment” rule — to end what has essentially become a taxpayer subsidy of union politics. A more substantial overhaul of PERA would begin by withdrawing the mandate that local governments bargain collectively, leaving them free to bargain with unions at their discretion. If state policymakers choose this option, they should also provide some basic rules to protect workers and taxpayers, including a prohibition on agency fees, a nullification of contracts that contradict state or local laws, and the retention of both secret-ballot certification elections and the members’ power to decertify their unions. It is settled law that the Legislature could prohibit collective bargaining at the local level altogether. It is not at all clear that government employees need collective bargaining to protect their influence, given their civil service protections and given their unique knowledge of government operations and their regular contact with decision-makers — assets that are particularly valuable in the political context. It is also unclear that collective bargaining improves employee morale. In any other context where two parties bargain to reach an agreement, including private-sector collective bargaining, it is understood that all parties are free to break off negotiations if they wish — a principle of “win-win or no deal.” PERA is unique and problematic in insisting that unions and governments bargain. This inflexible mandate has resulted in the creation of numerous contracts that are not in the public’s long-term best interest. If government exists to advance the public interest, then the law ought not to enshrine any procedure that detracts from the public interest. Ideally, the Legislature would repeal PERA and ban public-sector collective bargaining in local government, ensuring that local governments overcome the numerous problems associated with mandatory collective bargaining and that the state makes a clean break from an era of undue public-sector union influence over government. If legislators are uncertain about that step, they should repeal PERA’s collective bargaining mandate and leave public-sector collective bargaining — with basic protections of the public interest — at the discretion of local government. At the very least, the Legislature should undertake targeted reforms like those mentioned above. In any event, the Legislature should act, and act decisively. Public officials in local government and school districts should no longer be pressured into signing contracts that are not in the best interests of the public they were elected to serve.